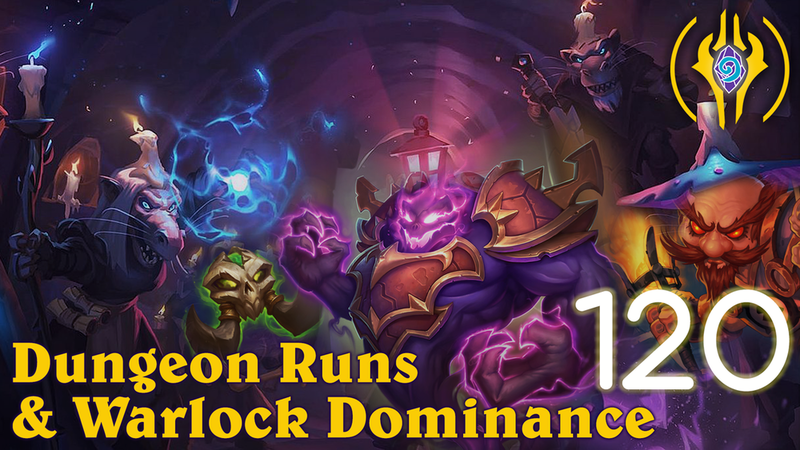 This week the Chosen cast cooked up some thoughts on the Rexxar response from Blizzard, extended chatter on the bosses and items within the dungeon runs, and finishes off the show talking about a spicy new Warlock Deck that has taken the ladder by storm. Deathstalker Rexxar: Blizzard has given into reddit and will add more beasts to DK Rexxar’s hero power in upcoming patches; Many players have noticed that Deathstalker Rexxar’s Hero Power does not include any of the new Beasts that were added with the Kobolds & Catacombs expansion. Since then, some players have provided constructive feedback regarding the state of Deathstalker Rexxar, and we agreed that a change to the Hero Power was warranted. As such, we will be updating Deathstalker Rexxar’s Hero Power to include new Beasts going forward. Please be patient, as this is a fairly complicated endeavor and we may need to start with a smaller change before a more permanent solution is implemented. We don’t have a date for this change to share with you today, but we will provide more information once we have it. Please also note that as new Beasts are released, we may need to mark some of them as exempt for various reasons, much like how King of Beasts is currently excluded from the pool of Beasts that Deathstalker Rexxar’s Hero Power can pull from. Thank you for providing constructive feedback. We see your love and passion for Hearthstone and believe that the best way to make Hearthstone better is to do so together. See you all in the Tavern! Winter Veil: ‘Tis the season! In celebration of Winter’s Veil—and to give all you adventurers something to do that doesn’t involve taking candles—Greatfather Kobold has prepared a special distraction, er, Winter’s Veil tavern brawl packed with wacky, waxy gifts! These treats aren’t just on the game board! The reward for winning your first game of this Tavern Brawl is THREE festively frosty Knights of the Frozen Throne card packs! Greatfather Kobold’s helpers have been busy decorating the Orgrimmar game board for the tavern brawl, but you can also experience the holiday in Stormwind while enjoying other play modes. And no matter how you play, don’t forget to show your opponent some holiday spirit with the return of the Happy Winter’s Veil greeting emote! Greatfather Kobold will drop off some tastefully wrapped, candle-bearing gifts on turn one—four on each side of the board, for a total of eight. If you unwrap a gift, you’ll receive a Legendary minion that costs three fewer mana to play! Greatfather Kobold will keep the celebration going by periodically parachuting in more presents. Don’t be greedy, though! You’ll only get a discounted Legendary minion from the gifts Greatfather Kobold left on your opponent’s side of the field. The Wacky Waxy Winter’s Veil brawl begins December 20 and lasts through December 24, so be sure to drop in and celebrate! Crystal Gem: Passive; Start with an extra Mana Crystal. Potion of Vitality: Passive; Double your starting Health. Sceptre of Summoning: Passive; Your minions that cost (5) or more cost (5). Justicar’s Ring: Passive; Your Hero Power is upgraded and costs (1). Wish: 10 mana; Fill your board with Legendary Minions. Fully heal your hero. Rod of Roasting: 10 mana; Cast ‘Pyroblast’ randomly until a hero dies. Portable Forge: 1 mana Discover a Legendary weapon and equip it. Grommash’s Armguards: Passive; Your weapons cost (1). Orb of Destruction: 3 mana; Destroy two of your opponent’s Mana Crystals and they discard 2 cards. Wondrous Wand: Draw 3 cards, Reduce their costs to (0). NOTE: there is also a NO CUBE list that surfaced right after the show from WireR using The Darkness. Official Sponsors of Velen’s Chosen: Jamie S.